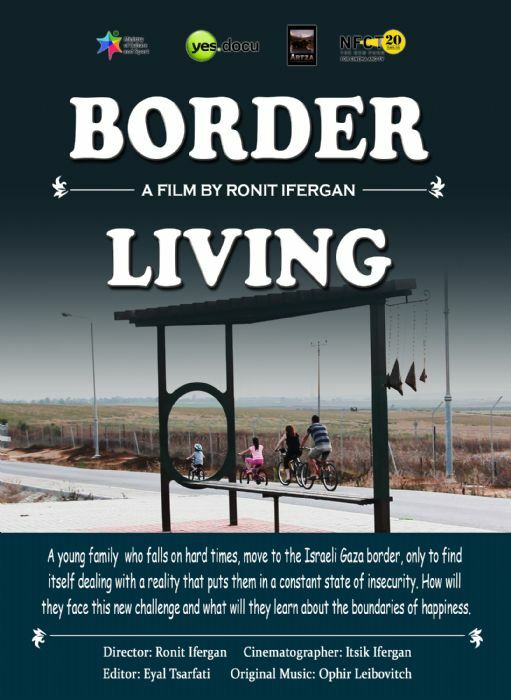 A young family falls on hard times and decides to move to the Israeli/Gaza border. They find themselves dealing with a reality that places them in an ongoing state of insecurity. How do they face this new challenge and what do they learn about the boundaries of happiness? Like many young couples my husband and I realized we could not afford to live in a big city. We decided to leave central Israel and move, with our two young kids, to the cheapest place we could find: Kfar-Aza, a beautiful kibbutz on the border of the Gaza Strip. The Kibbutz offered a prosperous and relaxed atmosphere and our small family quickly adjusted to this hospitable environment. Then came the first Qassam missile from Gaza followed by a second and a third… we felt that the new life we had just come to love was beginning to fall apart. The film documents the last three years when the missiles falling on the kibbutz became routine. We debated with ourselves as to what was the ‘right’ thing to do. We asked ourselves tough questions about our responsibility as parents as we struggled with our children’s and our own anxieties. Although it may seem unbelievable, we found in our hearts the courage to cope with the situation and eventually we became stronger. This is an intimate documentary of a family’s survival in a complex Israeli reality, in a place that makes one re-examine all one’s boundaries and beliefs.